More Duck Run as the Wandering Palate gears up for a New Zealand migration conducting a duck curry cooking class at the legendary Ruth Pretty Cooking school, here is the updated recipe, pairing to Kiwi Pinot Noir. Like all good recipes (and pinots), there is always a secret component or method that the chef will inadvertently not tell you; in this case, it depends on whether you use curry paste or powder. Making your own curry paste is time consuming but rewarding if you have the motivation to do it. This dish is based on Malay Nonya curry instead of Thai red curry and has a yellow, mustard-like colour, rather than reddish-brown. In terms of convenience and comparable quality to homemade curry past, we use an excellent brand here in Singapore called Bengawan Solo; their Genuine Nonya Curry Powder which lists the ingredients coriander, dried chilli, fennel, cumin, turmeric, star anise, clove, pepper, cinnamon, nutmeg and cardamom. I would suggest looking beyond your supermarket shelf and seeking the assistance of your Asian grocer or specialty Asian produce stores which are becoming more prevalent these days and ask them for Nonya Curry Power at the same time Sambal (Malaysian style, has dried shrimp paste added) and Roti (Malaysian style bread, frozen). The other variable factor is the duck itself, and this will depend on how good your local Chinese restaurant and roast lacquered duck is. 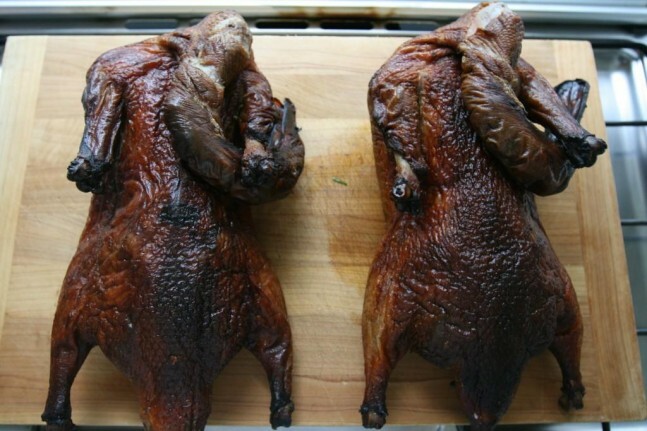 I am sure some of you will be puzzled with this dish calling for a bought-in cooked duck, moreover a Chinese roast duck. Many assume the duck would be cooked from scratch in the curry; however this does not work at all with the duck becoming very tough. It may seem like a culinary shortcut using a pre-cooked duck, but trust me, it works fabulously. I have been sourcing my duck in Singapore from ‘Gourmet Corner’ 15 Phillip Street #01-00 Tan Ean Kiam Bldg Singapore Tel: +65 6533 3033 for over five years now and nothing comes near it in terms of suitability for curry. They are large ducks, certainly fleshier than your average duck that is used for say Peking duck and in fact from Ipoh, Malaysia and known for their flavour and fleshiness with breast meat well over an inch thick. Venerated London based Financial Times food writer and chef, Nicholas Lander, believes the Four Seasons Restaurant http://fs-restaurants.co.uk/ is arguably the best Chinese roast duck in the world, clearly a good recommendation. 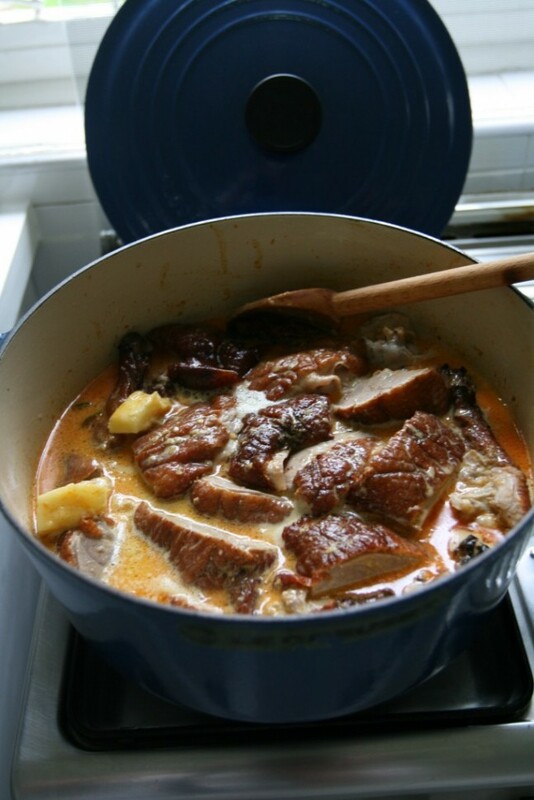 Given Chinese restaurants are ubiquitous, one would assume there is a decent roast duck to be had all over the world, although Frederic Drouhin of the famous Maison Joseph Drouhin in burgundy reports there is no such (duck) luck in his region, which is proving difficult for him to road-test the duck curry recipe. Perhaps someone can point him to the best Chinese restaurant in Paris and he can jump on the TGV. And the wine… well duck and pinot noir are gastronomic soul mates and I cannot think of many duck dishes where pinot noir does not pair reasonably well, in both western and eastern cooking, particularly with roasting and braising methods. There are perhaps exceptions in Asian cuisine like Peking Duck where a slightly sweet German Riesling goes well, and in fact riesling works very well in the realms of Alsace and German style duck dishes. In this instance however, the flavours of the Chinese roast duck with its infusion of star anise, garlic, clove and smoky flavours, along with the gentle spiciness and warmth of the curry on the palate, a pinot noir with good succulence of fruit and spicy warmth works best, and that logically means from New Zealand. That is not to say the pinot noir from other countries and regions do not work and in general this dish just soaks up pinot noir from anywhere, although from experience, edgy-leaner wines from say Cote de Beaune in their youth can be a little lost, as would the savoury complexities of a very mature burgundy. That said, this duck curry is by no means spicy-hot, in the chilli sense, rather it’s a gentle-warmth with lingering spiciness but there is a certain robustness about the dish and it calls for a more generous, rounded style of pinot noir with bold primary fruit. And on that note, I would like Kai Schubert of Schubert winery in Martinborough www.schubert.co.nz to take a bow for it was his ravenous enthusiasm for our duck curry that was the inspiration to document the recipe which has manifested to the global ‘Duck Run’. Kai is a rather tall and solid chap and let’s just say he has a good appetite and although of German origin, Kai is actually the Maori word for food, which is apt as it was just as well that I decided to get two ducks rather than usual one, as he managed to devour the best part of whole duck on his own. I thought he was going to eat the plate! Needless to say Schubert’s impressively profound pinot noirs are the consummate duck curry partner, even if they only make a cupful from their tiny vineyards in Martinborough and Wairarapa, you find their wines all over the world, as Kai likes to travel, as much as he eats. 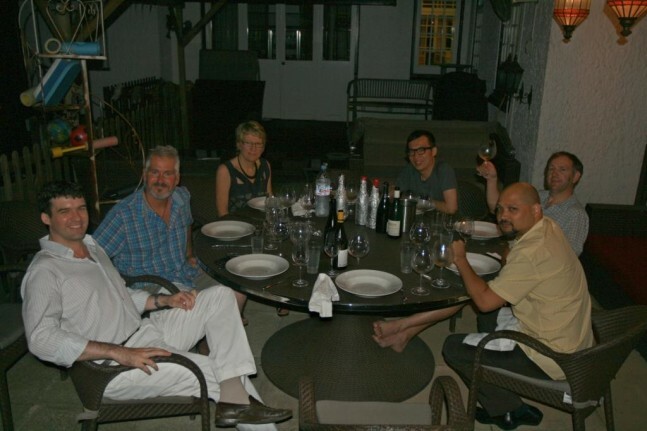 There is also evidence of other New Zealand Pinot Noirs being suitably tantalising the said duck curry, substantiated by a gaggle of Kiwi winemakers; Phyll Pattie from Ata Rangi, Mike Weersing of Pyramid Hills and Nicks Mills of Rippon, all at the Wandering Palate’s table recently. So, to all those pinot noir enthusiasts out there, who will obviously have no problem assimilating with duck and pinot noir; this is the perfect and relatively simple yet impressive home-cook dinner party recipe. Further to this, there is an extended menu incorporating a duck banquet, which utilizes the entire duck, including the carcase for soup and the pieces of duck meat that are too small for the curry yet great in a tangy Asian salad. My wife road-tested her duck banquet on Blair Walter, from Felton Road; not sure what it is with these kiwi vignerons but they sure can eat! And how about posting on the Wandering Palate http://www.facebook.com/curtisjohnmarsh favourite Chinese roast duck source and/or attempt to cook duck curry, enjoyed with a bottle of New Zealand Pinot of course! 1 bottle New Zealand Pinot Noir in winter, Pinot Rose in summer – to drink whilst cooking! NB: A good shortcut of nipping past your local Malay or Indian takeaway and picking up some Roti (bread) is recommended, but obviously if such exists in local to you. Otherwise there are a few brands of frozen Roti available in supermarkets that simply need pan-frying and do the job well. Using poultry scissors or sharp boning knife and a combination of fingers to separate from the carcase, remove the legs complete with thigh – cut at the base of the lower ribcage at joint using poultry scissors. Using your heavy casserole dish, adding a few slugs of olive oil, gently sauté your onions then mix together simmer 2 tablespoons of curry powder, for around 2 or 3 minutes. The amount of curry paste or powder will determine how intense/spicy you want the dish to be, so adjust to taste. Simmer the curry for 5 minutes tasting regularly and adding several slugs of the Thai fish sauce to taste. Likewise, add a few teaspoons of brown sugar which will give the curry a certain (hidden) sweetness and temper the spiciness. In essence, this is the variance in the dish, some days one seems to just get it better than others. Add pineapple pieces, then place the pieces of duck in the casserole, immersing in the curry fully, turning the pieces a few times to ensure soaking up the curry, simmer for another 5 minutes or so with lid on. DO NOT BOIL. Turn off heat and leave for a few hours if you have time, otherwise serve immediately. If you have prepared the night before, bring the curry up to a gentle simmer. Likewise if it has been resting for a few hours – add the basil leaves just before transferring to a large white serving bowl and sprinkle a few leaves on top for garnish. Yes, it’s all that simple!